Seventeen rescue robots are competing in Florida this weekend, where their task is to clear away debris, break through walls and climb ladders -- a test run for their use in future disaster scenarios. But the humanoid figures are still a little shaky on their feet. "Atlas" is attached to a hook, like a piece of meat, with his metal limbs dangling limply from his torso. Suddenly the 150-kilogram (330-pound) robot comes to life. The hydraulic system whines, an orange light starts blinking on the robot's head and a laser scanner shaped like a tin can rotates in its face. The knees begin to bend slowly, as Atlas cautiously places his two flat feet onto the ground. But now the device begins to falter. Atlas completes three triple steps in slow motion until he reaches a ramp. Behind a Plexiglas wall, researchers watch as the robot scans the obstacle with its laser. Finally, Atlas hazards to take one step up the incline, followed by a second and a third. But he makes his fourth step at a dangerously crooked angle, puts weight on the poorly placed foot and falls down. A safety cable cushions the robot's fall, and in the end Atlas is hanging from a hook once again. Is this what the beginning of a new era looks like? The researchers working on the Atlas project believe it is. The robot was developed by Boston Dynamics, which was recently purchased by Google. It is still being tested, but will have its big debut at the end of this week, when it will be expected to demonstrate what it can do at a competition in Florida. Embarrassing glitches like a misstep can't happen there. "Mistakes are part of the learning process," says Jesse Hurdus, project director of the ViGIR robot team. "Vi" stands for Virginia and "G" for Germany, because German experts from the Technical University of Darmstadt are part of the team. "Competitions inspire us, and they force us to tackle concrete problems," says Oskar von Stryk. The 49-year-old German robotics expert is attending a training camp in a warehouse on the outskirts of Christiansburg in the US state of Virginia. The disaster at Japan's Fukushima nuclear power plant marked the beginning of the "Robotics Challenge." Developers were rankled by how helpless robots were as they wandered through the radioactively contaminated reactor building. As they swerved around aimlessly in the steam, cables broke and the operators lost contact with the robots. It was a disgrace, and strategists with the US government's Defense Advanced Research Projects Agency (DARPA) were determined that it would not happen again. They compiled a list of eight tasks that robots would have to master in the future to be capable of performing well in disaster response. The tasks required in those situations, such as shutting valves, connecting hoses and removing debris, seem relatively straightforward, and yet they are hopelessly overwhelming to any conventional robot. At next weekend's competition, it will become apparent whether the world's top teams have managed to teach these abilities to their creations. At the event, seven Atlas clones will compete in a challenge on a racetrack near Miami. The competing teams' contribution will be writing the software to analyze the sensor data and to control a total of 28 limbs. Joining the seven Atlas robots at the starting line will be the 10 creations from various researchers and companies. They include dapper robo-astronauts, bug-eyed, muscular humanoids, ape-like robots and spindly machines resembling insects. The event will attract the sort of bestiary one might expect to see at a casting call for the next "Star Wars" trilogy. With the challenge only a few days away, the teams are feeling anxious about the tight schedule. "We only received our robot last summer," says Stryk. "Getting him ready by the date of the challenge will be difficult." It's quite possible, he adds, that many of the competitors will fail just as miserably as their counterparts did at DARPA's first big robotic challenge. At that event, held 10 years ago, the challenge was to complete an obstacle course with fully automated vehicles in the Mojave Desert. Many of the contestants failed at the starting line, while most of the others crashed into fences or embankments after only going a few meters, their engines still howling. Not a single vehicle came even close to the finish line. Nevertheless, the desert spectacle was more than just a race for aimlessly wandering, driverless cars. It marked the beginning of a dynamic technical success story. Only a year later, five vehicles completed the more than 200-kilometer (125-mile) route. The winner has since developed a car for Google that has already traveled more than 800,000 accident-free kilometers on American roads. This time, DARPA also hopes that its challenge will provide an impetus to the industry. Solving the tasks at hand will be "hard but not impossible," DARPA program manager Gill Pratt told the magazine IEEE Spectrum, noting that the event presents precisely the right challenge "to push the field forward." According to Pratt, just as driverless cars were on the threshold of a new era a decade ago, robots are now coming into an era in which machines will take on new tasks. So far, robots have been used primarily in industry, where large, powerful and expensive monstrosities perform highly specialized tasks. Barriers separate the machines from people. They have nothing in common with the intelligent humanoids portrayed in Hollywood films. But now a new species of robot is taking shape in R&D laboratories. Smaller, lighter and more flexible, they will be designed to be true partners for their human coworkers on factory floors. They wince when touched, and springs make their limbs so pliable that they no longer need to be fenced in. 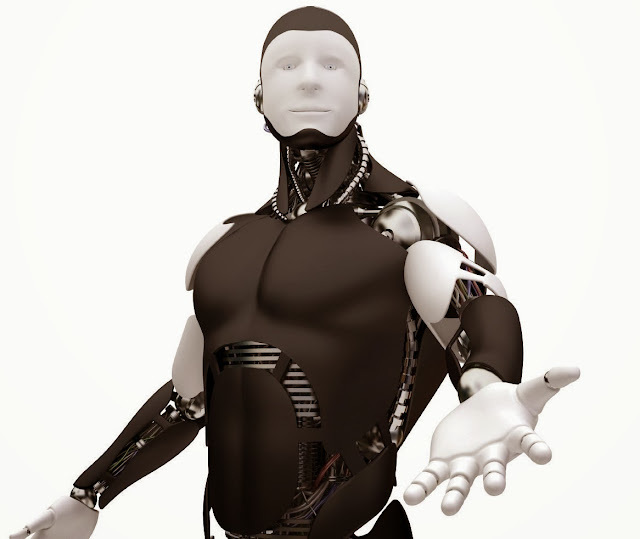 The researchers in Darmstadt founded a company called Bionic Robotics to build cheap robots for use in manufacturing. The American competitor Rethink Robotics has already gone a step further. Its humanoid robot, "Baxter," has even learned to operate a coffeemaker. The new robots being developed today increasingly resemble their creators, whose inspiration is not derived from science fiction films as much as it is from practical considerations. Developers have long weighed the potential for using robots in the household and in nursing care at home. And the more the machines make their way into our everyday lives, the more a human-like form is proving to be useful. Buttons, doorknobs and tools are meant to be used by human beings, so a machine designed to handle them ought to resemble a person as much as possible. Many researchers have backed away from the idea of fully autonomous robots. Instead, they are now focusing on the concept of "collaborative autonomy," which means that a robot should ask for help if it is having trouble completing a task. Stryk can imagine the development of call centers for robots in the future, in which a human technical support team helps an army of robotic servants cope with the pitfalls of everyday life. Researchers will be allowed to communicate with their machines during the challenge in Florida. However, data communication will be limited and patchy, just as it could be in real disasters. In many cases, humanoid robots do not particularly benefit from human assistance. During robotic training in Christiansburg, Atlas is still relatively clumsy, waving his arms indecisively and hesitating as he places one foot in front of the other while walking. Every movement the engineers are trying to teach Atlas reveals how complex even the simplest human actions can be. One of the tasks in the Florida challenge is to traverse uneven terrain. For a two-legged robot, each bump, crack and threshold presents a challenge. The robot tirelessly scans the surface with fisheye cameras and laser scanners to calculate where he should place his foot. And even then he still doesn't know whether the surface is elastic, sandy or soft. Atlas still moves very slowly, because his body is constantly in static equilibrium. This makes it easier to control the robot's movement, but it is also time-consuming. A person walks differently. He simply allows his body to fall forward and constantly offsets his weight in the next step. The engineers in Darmstadt are working on teaching Atlas this form of movement. The next task works relatively well, as the robot adjusts his arm with a whirring noise and rotates his wrist until it reaches the right angle. Finally, he grasps a drill with his hand. "This isn't as easy as it looks," explains Stryk's coworker Stefan Kohlbrecher, 33. "The machine can't wobble when it drills. Besides, its fingers have to be able to hit the button correctly." Another test, probably the most spectacular one, offers more pitfalls. In this one, Atlas is supposed to climb into a buggy and maneuver the vehicle through an obstacle course. During simulation, it becomes apparent that the robot is apt to slide around dangerously on the smooth plastic seats. To counteract the movement, Atlas has to hold onto the chassis while driving the buggy. During the field test, the researchers discovered that the robot, with its bulky hydraulic tail, doesn't actually fit behind the wheel. Now he will have to sit in the passenger seat, hold the steering wheel and step on the gas pedal while maneuvering his leg around the gearshift. "Sometimes completely banal things cause problems," says Kohlbrecher. For instance, the ladder Atlas is supposed to climb is tilted at such a sharp angle that Atlas can't hold onto the rungs without pitching forward. To address the problem, the developers obtained permission from DARPA to provide Atlas with an alternate hand. Instead of using carefully guided fingers, the robot will rely on a simple hook. Despite numerous glitches, the Darmstadt robotics experts are optimistic, given their experiences in dealing with the challenges of everyday robotics operations. They have also consistently performed at their best in competitions. "Many teams will run into problems while setting up their equipment at the site," predicts Kohlbrecher. "And that won't leave them much time to get everything up and running." Until the countdown in Miami, the team members will place all of their more sophisticated ideas and ambitious programming plans on the back burner. Now their only goal is to prevent Atlas from acting up at the crucial moment. As a reminder of sorts, a video is being played nonstop at the training camp. It depicts the robot, as it tries to grasp the drill, jumping into the air and then collapsing. The accident occurred because programmers had inadvertently set a parameter incorrectly, leading the machine to believe that it was holding an extremely heavy weight in its hand -- which it then tried to offset with its desperate jump. The Darmstadt engineers are keeping an anxious eye on their competitors' successes. SCHAFT, a Japanese company, has already shown that its jazzy red biped was successfully able to complete all tests. The New York Times has reported that Google also acquired the Japanese startup as part of a major offensive into robotics. The Atlas team from Florida and NASA's "Valkyrie" robot, which looks like it's ready for movie roles, are also considered frontrunners. The Darmstadt team derives some consolation from the fact that its robot doesn't necessarily have to come in first place to be considered a success. According to the DARPA challenge rules, the top eight finishers will qualify for additional funding to compete in a repeat challenge a year from now. It's clear that the German-American team's Atlas robot will not complete the obstacle course without errors. Nevertheless, the developers hope that many of their competitors will encounter even more problems.